The United Northwest Area residents come together to showcase the works of professional artists and local entrepreneurs in Open Bite Night Reloaded #BiggerAndDeffer to benefit local non-profits. 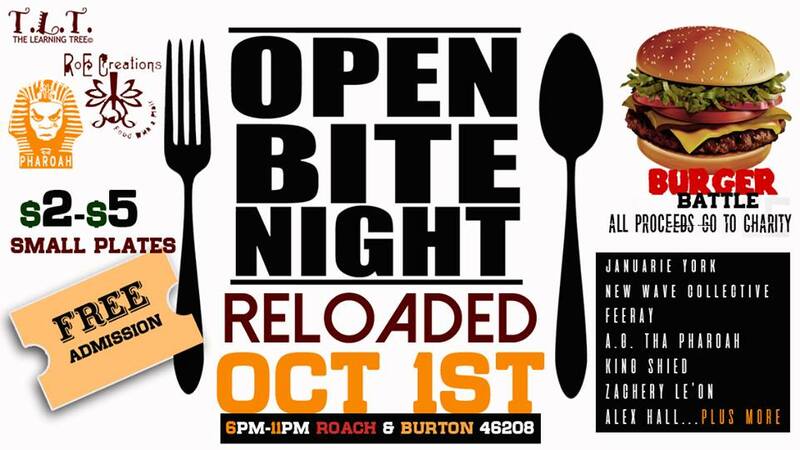 INDIANAPOLIS, IN – For the second time this year, on October 1, 2016, RoE Creations and The Learning Tree partner to bring together residents of the UNWA community for Open Bite Night (Reloaded) #BiggerAndDeffer. Held outside, block party-style at and around the intersection of Roache and Burton, a few blocks west of Watkins Park, Open Bite Night Reloaded #BiggerAndDeffer showcases the gifts and talents of a neighborhood. Poets, artists, and local entrepreneurs come together for an all day festival starting at 3:00pm. Come and experience delicious and beautiful dishes from local cooks, chefs, caterers and aspiring food professionals. Each culinary artist will offer a few different small plates so that you can sample from several creators. This event is meant to benefit everyone in our local community with proceeds going towards the GRoE, Choose Joy, and VOICES non-profits. Earlier this year, Open Bite Night launched to encourage local businesses and artisans. It came in the wake of a spate of police violence toward the African American community. The event proved to be a healing one, allowing residents to grieve and protest while celebrating a sense of community. Open Bite Night Reloaded builds on that sense of community. Open Bite Night Reloaded #BiggerAndDeffer kicks off with the opening of an open air art gallery and music at 3:00pm and a burger battle at 5:00pm. The official Open Bite Night Reloaded activities kick off at 6:00pm with live cooking (featuring small plates from various caterers and restaurateurs); live music (featuring open mic poets and a variety of musicians); and booths of neighborhood entrepreneurs and artists. Among the cooks that will be featured in our Open Bite Foodcase are: ROE Creations, Oya’s the Trap, Foodlovetog, SistaFriends, Indulge Personal Chef Services, Januarie York & Damon Dulin dba DaeWhy Unordinary Culinary, Exclusive Events, Anitra Malone, Lets Taste, Renee King dba Slice of Soul, Dulce Delights, Nicole Kearney dba Sip & Share, Niesha Nichole Neal dba the Neal Deal, Chef J.O. Jeremiah L. Oliver, Justin Calloway dba Culinary Designs by Justin, Crows Place, and more! Headlined by M’Reld Green and Januarie York, some of the artists that will be performing are: Earl Feeray Phillips, Dennis Adrien Green, Jeremy Rhetoryk McClure, Zachery Le’on, New Wave Collective, Lyndon Womack aka The Grand Chief, Alex Hall, Unequa Ganodu, Harlem Indynois, Hekima Ashé, Kay Diamond, and more! Here is a link to a short film about the first Open Bite Night. Here is a link to some footage from the first Open Bite Night. RoE Creations – a catering and community organizing small business here in Indianapolis. We are currently spearheading a community effort to feed children of the MLK neighborhood who may be going home to little or no food after school. The Learning Tree – a leading arts and community organization now in its third year of encouraging creative expression in the arts and nurturing the gifts and passions of the community. The Learning Tree and RoE Creations … harnessing the power of community.